Home / APPLICATIONS / How to Safely Recover Ethanol? How to Safely Recover Ethanol? As demand for low-carbon impact, domestically sourced fuels has increased, biofuels have become a fast-growing part of the energy sector. Biofuels are produced from renewable resources, such as grains, plant biomass, vegetable oils, and treated municipal and industrial wastes. They are flammable or combustible, and their manufacture can involve potentially dangerous chemical reactions. Employers must protect workers from the hazards of these fuels and their production processes. Ethanol is a flammable liquid that is readily ignited at ordinary temperatures. Renewable ethanol is produced by the fermentation of grains, or, using advanced technologies, from cellulosic materials such as waste paper, wood chips, and agricultural wastes. The production process can involve other hazardous materials, such as acids, bases, and gasoline (to denature the alcohol, or for blending). Up to 10% ethanol is blended with gasoline in most automotive fuel currently sold in the U.S. Higher ethanol blends, up to "E85" (85% ethanol blended with gasoline) are also available in some parts of the country. There have been biofuel- related accidents involving fatalities and injuries from burns, explosions, and chemical exposures. 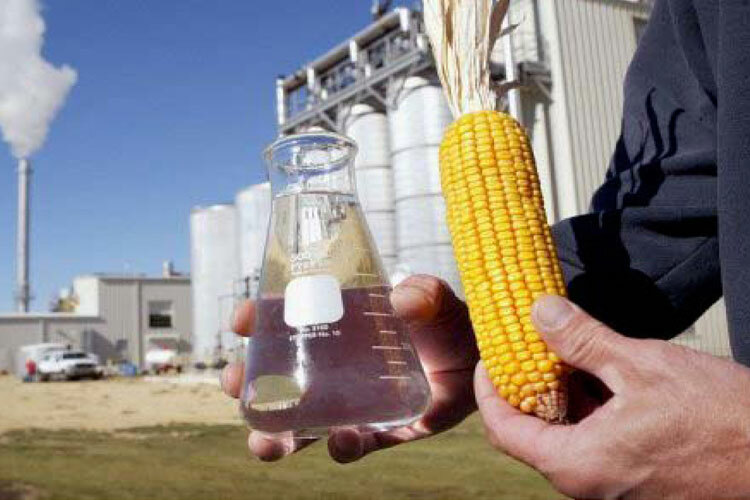 Which Industries are at Risk with Ethanol?